Trim fat and cut meat into slices of about 1/4″ – 1/8″ thick. Mix ingredients, coat meat, leave in bowl, cover and refrigerate over night. Oven – set oven on lowest temp., line cookie sheet with foil, place strips without touching, keep door propped open for ventilation and cook til pliable. Dehydrator – line racks with meat, without touching, and dry according to dehydrator’s instructions. Enjoy! I have a question for you. 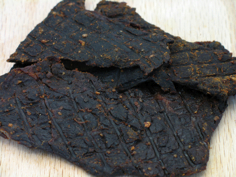 I make beef jerky all the time, your recipes look great. But I have a friend who want a garlic dill jerky with honey. Any suggestions? Sounds interesting, but not sure how much dill to use. Thanx!